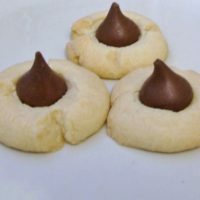 This Shortbread Hershey Kiss Cookies Recipe is perfect on the holiday cookie tray, for your sweeties on Valentine’s Day and every occasion in between. Usually I’m a bit more of a complex cookie maker – browned butter chocolate chip cookies, salted peanut butter cookies, molasses cookies – cookies that have major flavor going on. However, there’s something to be said about a simple buttery shortbread cookie that just melts in your mouth now and then. Not being one to leave well enough alone, I love jazzing up shortbread with chocolate, or Hershey’s Kisses in this case. 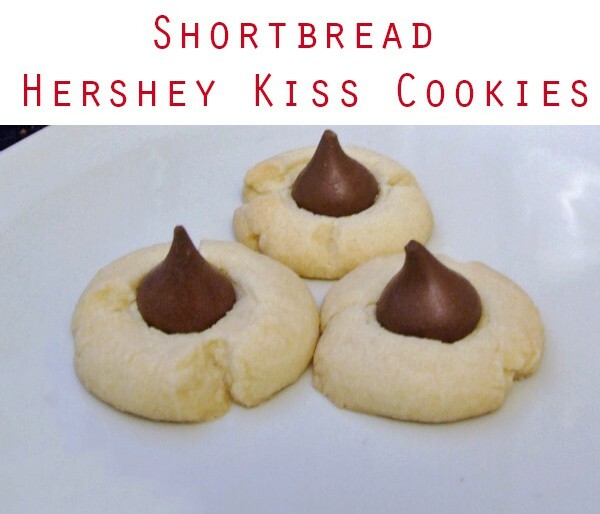 I find the unique flavor of Hershey’s Kisses to be a perfect compliment to the shortbread, plus everyone deserves a kiss on Valentine’s Day, and any other day, right? This way you can also give everyone a kiss under the mistletoe without getting in trouble with your significant other. ;) You could also use the candy cane kisses, which would look great for both Valentine’s Day and Christmas, or the cherry cordial kisses, or any flavor really. And honestly, these cookies are just as tasty as plain ol’ shortbread. 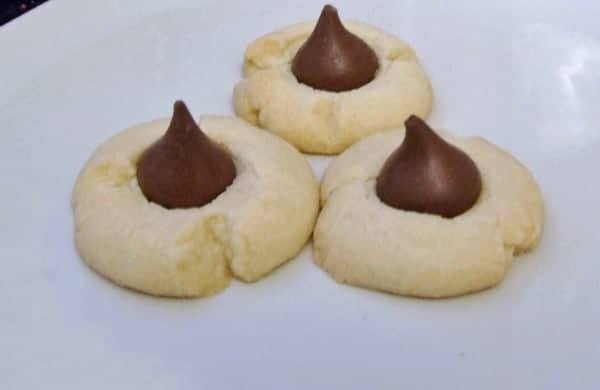 For this shortbread Hershey Kiss Cookies recipe I opt to use powered sugar for a smoother final product as granulated sugar can sometimes leave a bit of graininess. The cornstarch also helps to add a bit more delicate flavor and texture to the shortbread so that it is truly melt in your mouth. You can replace the cornstarch with more flour, but I would advise against adding more cornstarch as you can add too much, which will lead to sort of grainy and pasty mouth-feel. You could also dress these up for the holiday a bit more by adding chocolate chips or chunks or chopped cherries to the cookie dough itself. When I originally came up with this recipe I used half the dough for the traditional rectangular shortbread and half to make these shortbread Hershey kiss cookies, so I estimate you should get 30-45 cookies dependent upon size. Cream butter and sugar together with either a hand or stand mixer until thoroughly combined. Sift flour and cornstarch together and stir in salt. Add flour mixture and vanilla to sugar/butter and mix on medium to high speed until thoroughly combined. This will take a few minutes as you are making a mixture similar to pie crust and the butter needs time to be cut into the flour. If it seems to remain just too crumbly after several minutes, you can add a couple more tablespoons of butter. Form dough into a ball/disc, as you would pie crust, and wrap with plastic wrap. Refrigerate for at least 20 minutes or overnight. Preheat oven to 325°F if making the same day. Take heaping teaspoonfuls of dough and roll into balls with hands lightly dusted with powdered sugar. If dough starts to melt in your hands, place back in the fridge for 20 minutes. Place cookie balls onto baking sheet lined with parchment paper or a Silpat baking mat about 1 inch apart. At this point you can take a small clean glass and dip the bottom in powered sugar and flatten each cookie or use your thumb to create a crater that you press the kiss into later. Both seemed to work equally well for me, though I preferred the look of the thumb-pressed cookies more for this application. Note that these cookies will not rise or expand very much. Bake for 15-20 minutes or until edges have just a very slight golden tinge. Check at around 10-12 minutes if your oven runs really hot. These are not cookies you want to get brown. Remove sheets from oven and allow to cool for a minute. Then immediately place an unwrapped Hershey Kiss into the center of each cookie, pressing down lightly. Allow to cool completely and enjoy. Cookies can be stored at room temperature in air-tight container for up to 3 day. Unbaked dough can be stored in the fridge for up to 3 days (wrap tightly so it doesn't dry out) or in the freezer for up to 1 month. These are also great with Rolo's, mini peanut butter cups, and other candies. If you enjoyed this Shortbread Hershey Kiss Cookies recipe, check out our Browned Butter Chocolate Chip Cookies recipe too! Hi, is the cornstarch necessary? Could I substitute with arrowroot powder or tapioca flour? Hey, Vicky, thanks for stopping by. I haven’t baked this recipe without the cornstarch so I can’t say for sure how it would turn out with the options you mentioned. The safest option, in my opinion, would be to use the same amount of AP flour in its place. If you use other starches you may need to play around with the amount used. The cornstarch just gives the cookies a bit more delicate texture. Good luck and please let me know how it turns out! I’m so glad you liked it, Strepsi. Love your mother’s name for them, hahaha. I really love how this recipe came out, although when making the recipe the dough was very crumbly and dry. i had to then go and melt more butter to make the dough not dry and stick. Overall it was a very good recipe, I was surprised to see cornstarch used, but in the long run even the dough tasted really good. Thanks so much for trying my recipe and letting me know how it turned out. I’m glad you enjoyed it! Cornstarch does seem like a strange ingredient at first but it does help the cookies be more tender and delicate.